Prenatal One Multivitamin - this once-daily prenatal multivitamins provides potent vitamins and minerals in a base of superfood extracts that promote baby's healthy development, and support mom's nutrition and energy, in just one tablet a day. Plant-source enzymes, ginger juice and probiotics support digestion and absorption, for no stomach upset. Prenatal One is 100% natural, vegetarian and vegan, and is guaranteed to be free of animal ingredients throughout every stage of the production process. 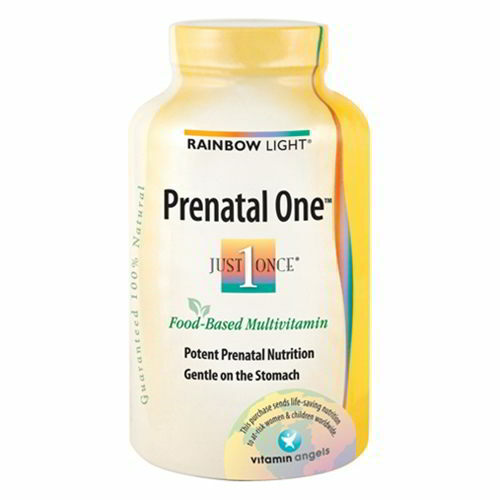 Prenatal One contains no gluten, soy, yeast, milk, eggs, nuts, fish or shellfish. It is also lactose-free and contains no artificial colors, flavors, sweeteners, preservatives or additives. Prenatal One contains essential nutrients in potencies that deliver optimal nourishment and protection for your and your baby throughout pregnancy and nursing, including 30 mg of iron to support metabolism and red blood cell production, 400 IU of vitamin D2 to promote healthy bones and teeth, plus 100 mg of vitamin C and 4,000 IU of vitamin A to support skin, eye and immune health. 800 mcg of folic acid -- critical for preventing birth defects -- promote healthy new cells and baby's brain, skull and spinal development. * High potency vitamin B complex provides natural energy and promotes cell development and stress and immune support. Rainbow Light works with Vitamin Angels, an international aid organization, to fight malnutrition around the world. Each purchase of this product helps us deliver life-saving nuritional support for at-risk infants, children and mothers. Prenatal One is VeganGuard guaranteed to be free of animal products. It is Allergen SafeGuard guaranteed to contain no gluten, soy, yeast, milk, eggs, nuts, fish or shellfish. It is wheat-free, sugar-free, dairy-free, lactose-free and yeast-free. It is also 100% natural and contains no artificial colors, flavors, sweeteners, preservatives or other additives. For comprehensive daily nutrition, protection and energy, take once per day, with or between meals. Packaged in 100% recycled, 100% recyclable BPA-free Eco·Guard packaging with a 92% lower carbon footprint than virgin plastic. Other Ingredients: (natural mineral or vegetable source): microcrystalline cellulose, stearic acid, modified cellulose, silica. Coating: Vegetable food glaze (Hydroxy propyl cellulose, pharmaceutical glaze).